With the development of the printing press, numerous Herbals began to be printed. Because of the importance of identification, early herbals were some of the first printed texts to have wide use of illustrations, including the use of hand colored woodcuts in early editions. The following list of texts between 1470–1670 covers the major Herbals of the West. Some are pure Herbals, while some are texts which have sections on herbs. 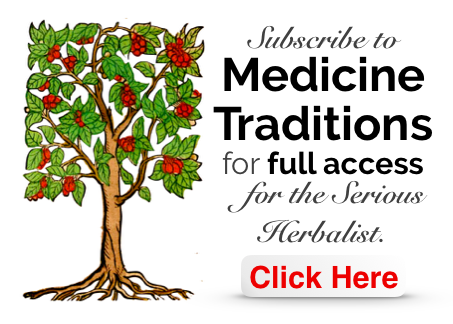 A few are texts on Distillation or Medical treatment that also cover herbs. Many are downloadable, in some cases in full color. The list has been based on the list of Herbals in the appendix of ‘Herbals, Their Origin and Evolution’, Agnes Arbes, 1912. Bartholomaeus Anglicus [Glanville, Bartholomew de]. Liber de Proprietatibus Rerum. [Cologne, 1470? The Latin Herbarius [referred to by various authors as ‘Herbarius’, Aggregator de Simplicibus, Herbarius Moguntinus, Herbarius Patavinus, etc.] [Peter Schoffer. Mainz.] 1484. The German Herbarius [referred to by various authors as the Herbarius zu Teutsch, the German Ortus Sanitatis, the smaller Onus, Johann von Cube's Herbal, etc.] [Peter Schoffer] Mencz, 1485. — (Another Edition). [Sorg.] Augspurg, 1485. — (Another Edition). [French translation], 1501?. Ortus Sanitatis [Hortus Sanitatis] Jacobus Meydenbach. Moguntia, 1491. Braunschweig [Brunschwig], Hieronymus [Jerome of Brunswick]. Liber de arte distillandi. de Simplicibus. Johannes Grueninger. Strassburg, 1500. Herball. Rycharde Banckes. London, 1525. — (Another Edition). Macers Herbal. Robert Wyer. London, 1530? — (Another Edition). Charynge Crosse. London. 1535? — (Another Edition). A litle Herball of the properties of Herbes … Anthony Askham, Jhon Kynge. London, 1550. Grand Herbier. Le Grand Herbieren Francoys. Pierre Sergent. Paris, n.d.
— (Another Edition). The Grete Herball, Peter Treveris. London, 1526. — (Another Edition). The Grete Herball, Imprynted at London, Peter Treveris, 1529. Turner, William. Libellus de re herbaria novus, Londini apud Joannem Byddellum. 1538. Matthiolus, Petrus Andreas [Mattioli, Pierandrea]. Commentary on Dioscorides, Venetia, Nicolo de Bascarina da Pavone di Brescia, 1544? Turner, William. The names of herbes in Greke, Latin, Englishe Duche and Frenche wyth the commune names that Herbaries and Apotecaries use. John Day and Wyllyam Setes. London, 1548. — (Another Edition). The Names of Herbes, A.D. 1548. Edited by James Britten. London, 1881. — The seconde parte of William Turners herball. Arnold Birckman. Collen, 1562. — The first and seconde partes of the Herbal of William Turner... with the Third parte, lately gathered .... Arnold Birckman. Collen. 1568. Amatus, Lusitanus [Castello Branco, J. R. de]. Commentary on Dioscorides … Venetiis, 1553. Dodonseus, Rembertus [Dodoens, Rembert]. Cruydeboeck ... 1554. Maranta, Bartholomseus. Venetiis, Ex officina Erasmiana Vincentii. Valgrisii, 1559. — (Another Edition}. Joyfull newes out of the newe founde worlde, wherein is declared the rare and singuler vertues of diverse… Hearbes... Englished by John Frampton. London, W. Norton, 1577. Bombast von Hohenheim (Paracelsus). Ettliche Tractatus des hocherfarnen unnd berumbtesten Philippi Theophrasti Paracelsi.... I. Von Natiirlichen dingen. II. Beschreibung etilcher kreutter. III. Von Metallen. IV. Von Mineralen. V. Von Edlen Gesteinen. Strassburg. Christian Mullers Erben. 1570. Lobelius, Mathias [de L'Obel or de Lobel, Mathias] and Pena, Petrus [Pena, Pierre]. Stirpium adversaria nova. Londini. 1570. Carrichter, Bartholomseus. Kreutterbuch… Gedrucktzu Strassburg... bey Christian Muller. 1575. — Irenes accurate...delineatae praecipuarum stirpium, quarum descriptiones tarn in Horto.... Impressum Francofurti ad Moenum. 1588. Matthiolus, Petrus Andreas [Mattioli, Pierandrea]. Kreuterbuch,… Frankfurt, gedruckt bei Johann Feyerabend. 1590. — (Another Edition). Kreutterbuch… gemehret, unnd verfertigt, Durch Joachimum Camerarium… Gedruckt zu Franckfurt am Mayn. 1600. — (Another Edition). The Herball or Generall Historic of Plantes.... Very much Enlarged and Amended by Thomas Johnson Citizen and Apothecarye of London. London, Printed by Adam Islip, Joice Norton and Richard Whitakers. 1633. — (Another Edition). A Garden of Flowers.... Printed at Utrecht By Salomon de Roy. 1615. Olorlnus, Johannes [Sommer, Johann, aus Zwickau]. Centura Herbaruin Mirabilium Das ist: Hundert Wunderkrauter.... Magdeburgk, Bey Levin Braunss.... 1616. — Centuria Arborum Mirabilium Das ist: Hundert Wunderbaume.... Magdeburgk, Bey Levin Braunss.... 1616. Bauhlnus, Joannes [Bauhin, Jean] and Cherlerus, J.H. [Cherler, J.H.]. Historiae Plantarum Generalis ... Ebroduni, Ex Typographia Societatis Caldorianae. 1619. Bauhlnus, Caspar [Bauhin, Gaspard]. Theatri Botanici ... Francofurti ad Moenum, Typis Pauli Jacobi, impensis Joannis Treudelii. 1620. Popp, Johann [Poppe, Johann]. Krauter Buch,... Leipzig, In Verlegung Zachariae Schiirers, und Matthiae Gotzen... 1625. Donati, Antonio. Trattato de semplici,… in Venetia,…Appresso Pietro Maria Bertano. 1631. Johnson, Thomas. Mercurius Botanicus:… Londini, Excudebat Thorn. Cotes. 1634. Culpeper, Nicholas. A Physicall Directory or A translation of the London Dispensatory Made by the Colledge of Physicians in London...with many hundred additions.... London, Printed for Peter Cole... 1649. — (Another Edition). The English Physitian enlarged.... London, Printed by Peter Cole... 1653. How, William. Phytologia Britannica. Londoni, Typis Ric. Cotes, Impensis, Octaviani Pulleyn. 1650. Bombast von Hohenheim [Paracelsus]. Paracelsus his Dispensatory and Chirurgery....Faithfully Englished, by W. D., London: Printed by T. M. for Philip Chetwind.... 1656. Cole, William [Coles, William]. The Art of Simpling. London, Printed by J.G. for Nath. Brook. 1656. Cole, William [Coles, William]. Adam in Eden: or, Natures Paradise…. London, Printed by J. Streater, for Nathaniel Brooke.... 1657. Lovell, Robert. PAMBOTANOLOGIA, sive Enchiridion Botanicum, or a Compleat Herball… Oxford, Printed by William Hall, for Ric. Davis… 1659. Turner, Robert. BOTANOLOGIA. The Brittish Physician: or, The Nature and Vertues of English Plants. London, Printed by R. Wood for Nath. Brook. 1664. Aldrovandus, Ulysses [Aldrovandi, Ulisse]. Ulyssis Aldrovandi... Dendrologiae Naturalis Scilicet Arborum Historiae.... Bononiae typis Jo. Baptistae Ferronii. 1667.